By now, you probably know what voice search is due to the Siris & Google Homes of the world. However, you may not be sure if it is something you should include in your digital marketing strategy. 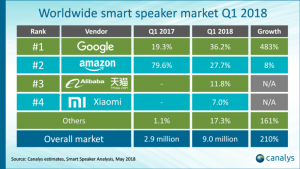 According to Canalys, sales of voice-activated assistants have already grown by 210% when comparing Q1 2017 to Q1 2018 and voice search is already heavily used to gather more information on local businesses. Additionally, according to a research study conducted by BrightLocal, 58% of consumers have used voice search for local searches in the last 12 months with most of those searches focusing on finding information on local restaurants, grocery stores, and food delivery. While the predominant use of this technology is focused on food industries, we can expect voice search to continue to grow and expand into even more services & industries. 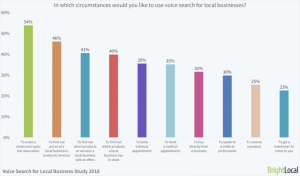 The below chart highlights the popularity of utilizing voice search for different local business scenarios. Of the consumers evaluated in the study, 32% of respondents said that they would utilize voice-activated assistants to buy directly from a business. While voice search is still a new advertising arm in the industry, early adopters can find themselves at the forefront of a refreshing and authentic way to speak to consumers. Even if you are not sure if voice search is right for your business, there are several steps you can take to ensure your bases are covered if you ever wanted to activate a stronger strategy or increase your digital presence. At first glance, this may seem tricky to organically weave into your website content. First, start with thinking about how you would converse with someone about your business and expertise. Then you can start to build content that is in line with how someone would utilize voice search to look for information about your business. In general, FAQs are a great way to share the facts about your business but since most voice searches come in the form of questions it is even more important in your overall SEO strategy. To stay on top of this trend, make sure you optimize your website content to answer questions that strongly relate to your business. If you think about how someone would naturally ask a question, you will notice that the phrases and words they use are generally longer than what a standard SEO strategy would optimize for. To cover both bases, make sure you focus on a mixture of long-tail as well as short-tail terms. If your business owns a brick and mortar location, local search, in general, should be one of your top priorities. Here are some steps to ensure your local digital footprint is working hard for you. First make sure your Google My Business information is up to date and accurate. Also make sure that all your standard business information such as address, phone number & hours are updated and accurate on your website. This way, when someone uses voice search to find a local recommendation, your business will be included as an option. Optimizing your website for voice search also goes beyond being the first result. Some additional benefits include obtaining position 0 – the very top position above Paid Search & Organic Search listings on a Search Engine Results Page, otherwise referred to as featured snippets. It also gives you an opportunity to learn more about your target consumers and it can help you generate new ideas, whether that is content for a blog or even a product adaptation.